We made it to Canada! Our border crossing at Calais Maine consisted of a 5-minute conversation about where we’re going, what we’re doing, and what we’re bringing with us. When asked about weapons including pepper spray, we mentioned our bear spray for hiking and were told that as long as it’s labeled for animal defense (which it is), we’re good. We switched R2’s dashboard computer over to the metric system and started to familiarize ourselves with driving in Canada. Apart from the obviously different KPH speed limits (110 KPH is around 70 MPH), we had a surprisingly hard time figuring out what all the symbols meant on the highway information signs! 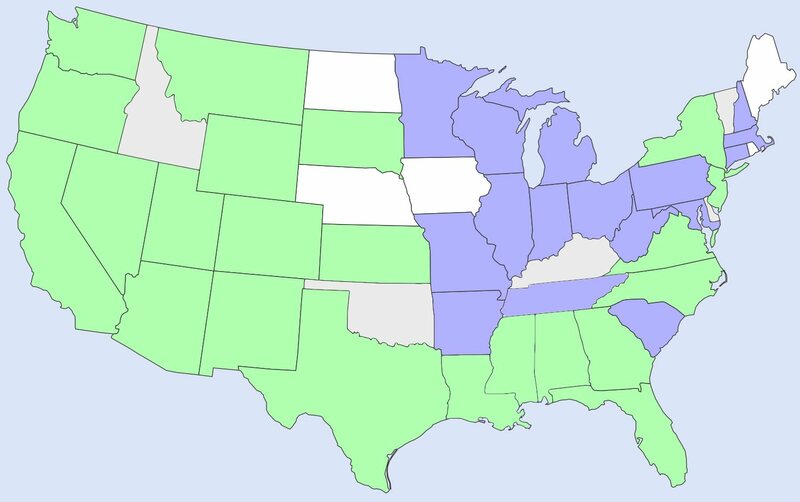 Turns our we’re not the only ones—when I searched the Internet for answers, I found several other articles with similar themes. 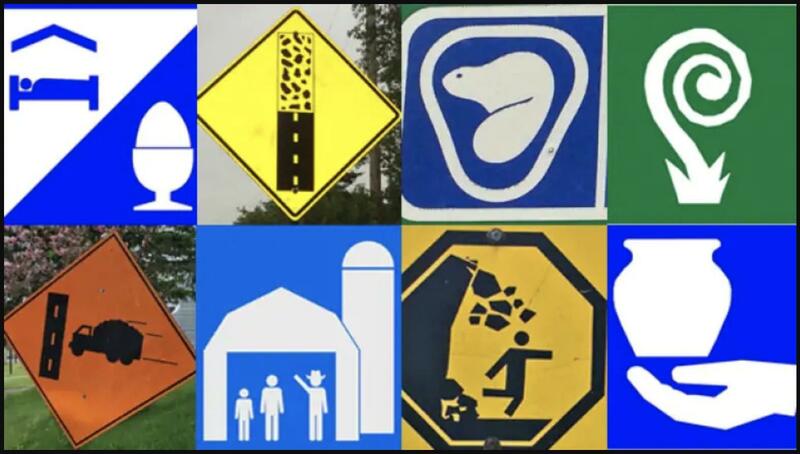 Take a quick detour and read through this one for a fun look at some Canadian highway signs! Our base of operations for the week was Sussex, New Brunswick. While not exactly close to anything we wanted to do, it was centrally located enough that we could park R2 there and do a LOT of driving in Red to explore the area. The alternative would have been packing up and moving R2 every couple days which seemed like more of a hassle. We also quickly discovered that while the main Canada highways are generally in excellent condition and great to drive in the rig, most of the secondary roads to the places we wanted to visit were in terrible condition. While driving them in the car we commented on how the road’s patches have patches, and so on. The Sussex KOA was a pretty good place to camp for 6 nights, though we only had 30-amp electrical service at our site (which is going to be a theme during our stay in Canada) so we had to be careful with air conditioner, water heater, and kitchen appliance use. 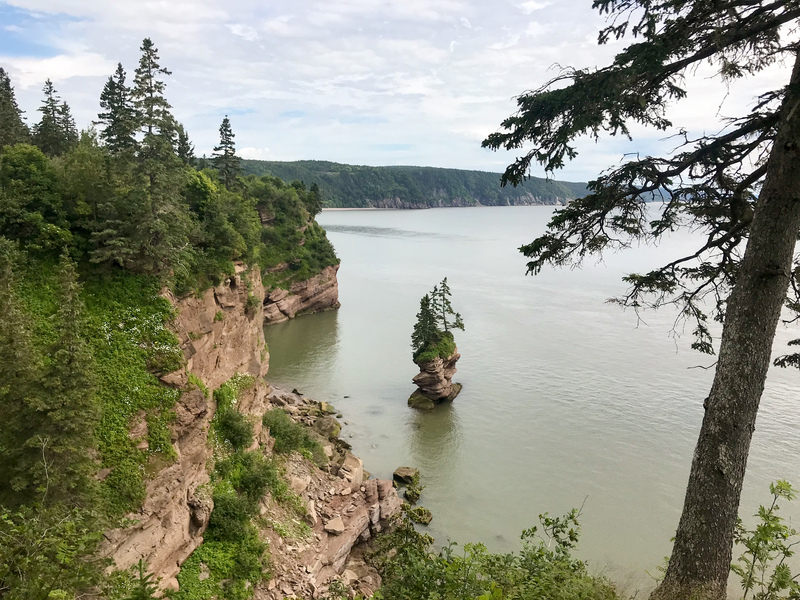 We made three big excursions from our Sussex home base: 1) the Fundy Trail Parkway; 2) Fundy National Park; and 3) Hopewell Rocks. 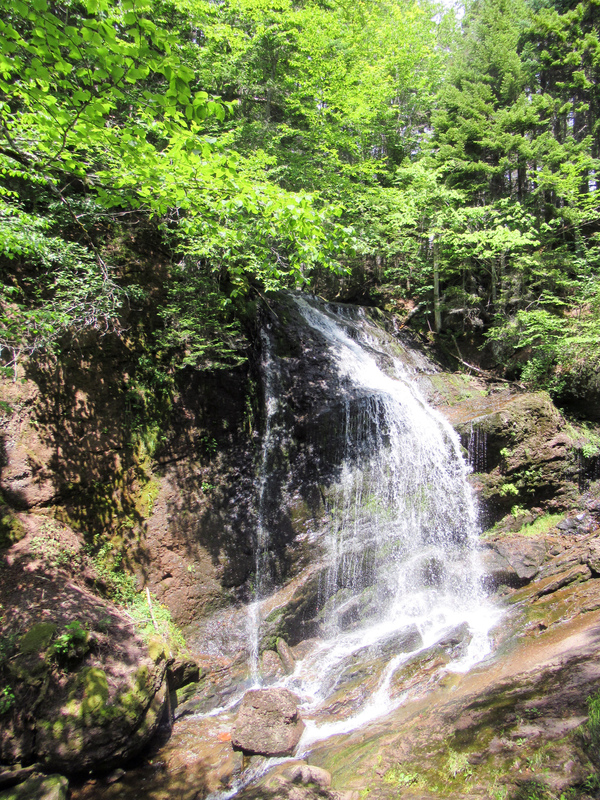 The first excursion, at around one hour along winding, bumpy roads, was the Fundy Trail Parkway. 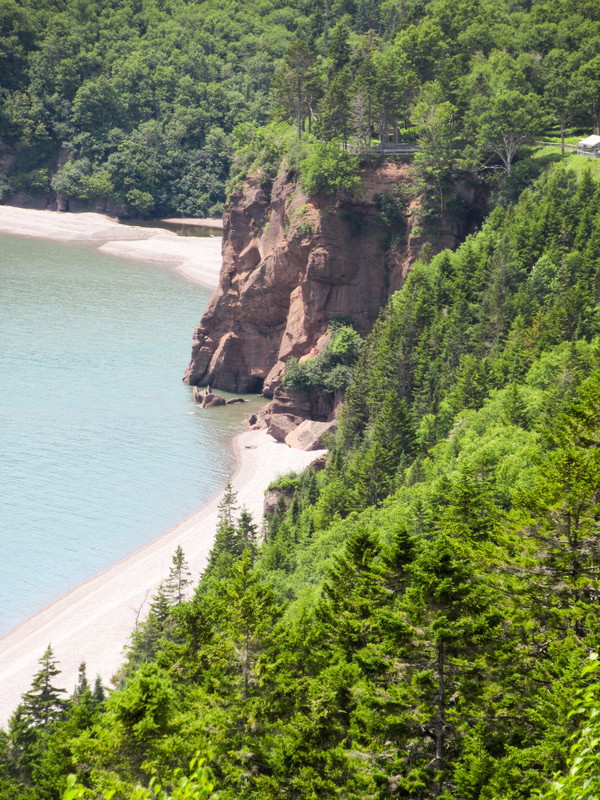 This is a non-profit coastal park featuring a 19-mile drive hugging the shore and cliffs of the Bay of Fundy. There are dozens of parking areas along the way, each with trails, overlooks, picnic tables, and attractions like beaches or waterfalls. 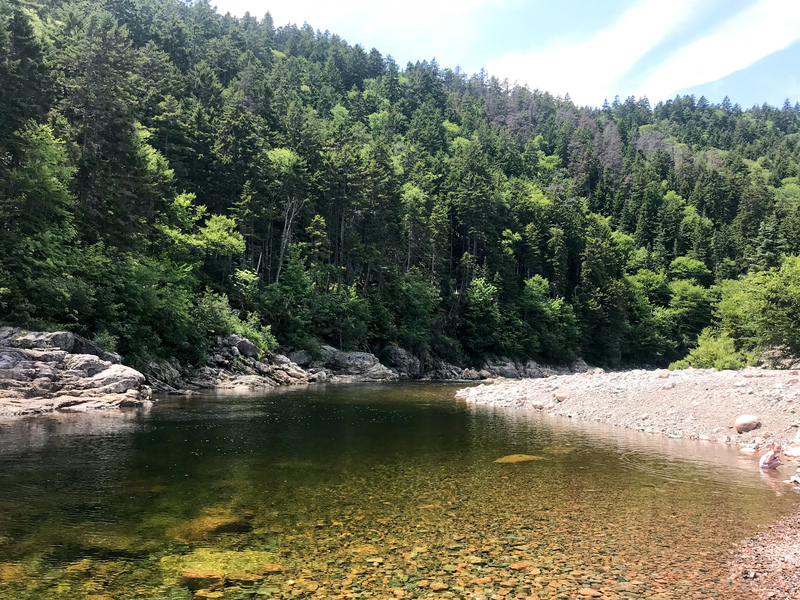 There’s even a 38-mile trail that runs the length of the park and continues eastward to Fundy National Park, with more than 8,000 feet of elevation gain to deal with! 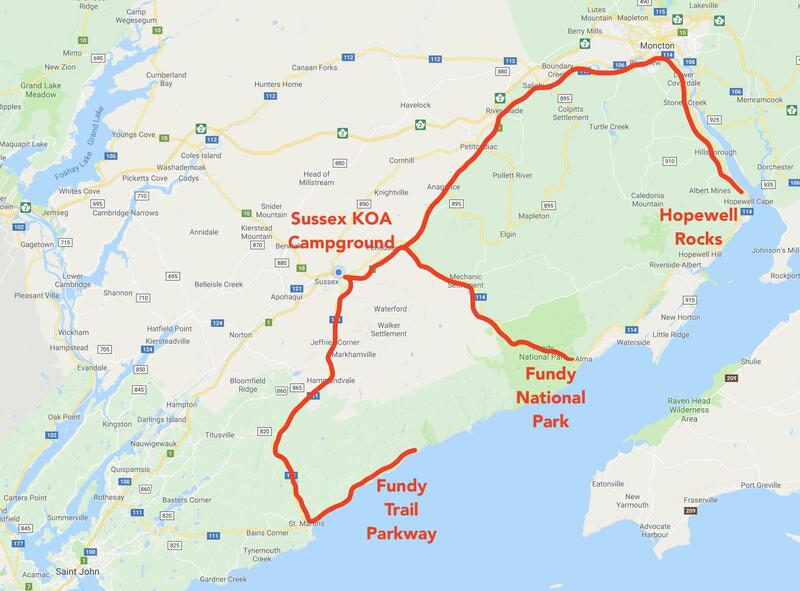 The park is relatively new and the road is still being extended and will connect with Fundy National Park in a couple more years, making the park even more accessible. A “flowerpot” formation created by erosion from the extreme tides. Also check out the close-up photo below. 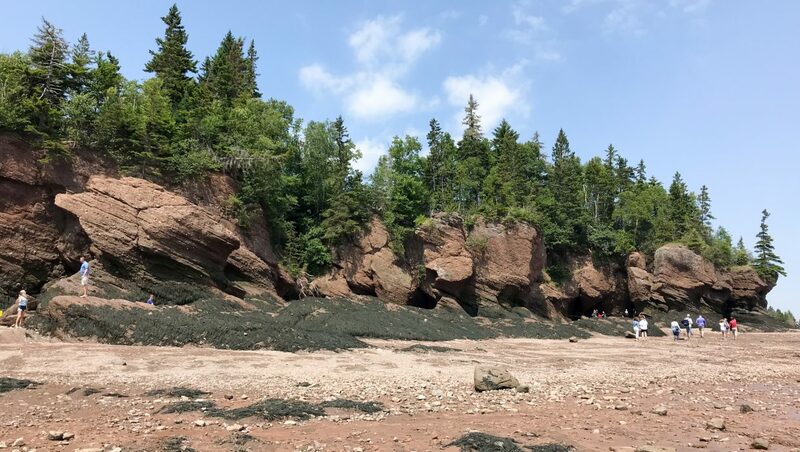 Much of the coastal geology in the area is shaped by the massive tides created in the Bay of Fundy. A few factors combine to give the Bay the highest tides in the world… over a 50-foot difference between low and high tide in some areas! You can read more about how the tides work at the Bay of Fundy web site. Visiting anyplace along the bay can be a completely different experience during low tide vs. high tide! With the park being so far from “civilization”, we were pleasantly surprised to find it nearly deserted during our visit. We stopped at many of the overlooks to take in the beaches, cliffs, and rock formations, and rarely saw another person. Along the way we took a few relatively short hikes to streams, waterfalls, vistas, and across a long pedestrian suspension bridge over the Big Salmon River. Opie isn’t crazy about bridges like that, but he did great and was rewarded on the other side with a fun soak in the cool river water. 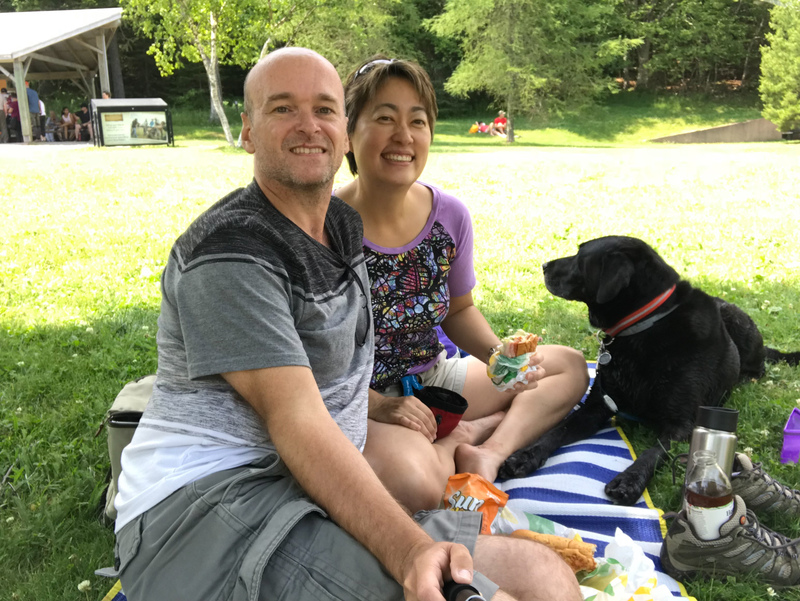 We bought a picnic lunch (OK, it was a sandwich from Subway) and ate on a bench overlooking Fuller Falls. We stopped by the visitor center to refill our water bottles and Opie was treated by the staff to a dog biscuit which he immediately devoured. 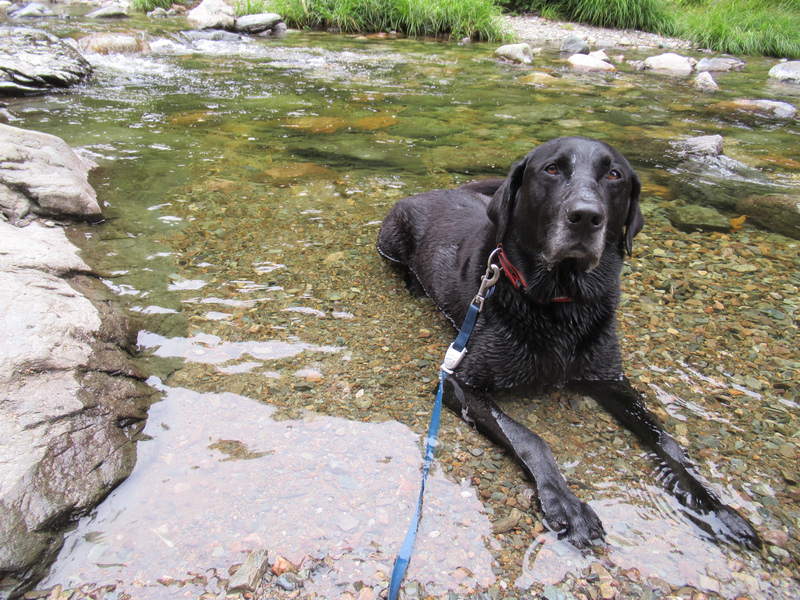 A nice river for Opie to cool off in! Eventually we made it to the current end of the road (construction of the next segment is ongoing), and took a longer hike to the Walton Glen Gorge Falls Observation Deck that sounded very beautiful in the brochure! 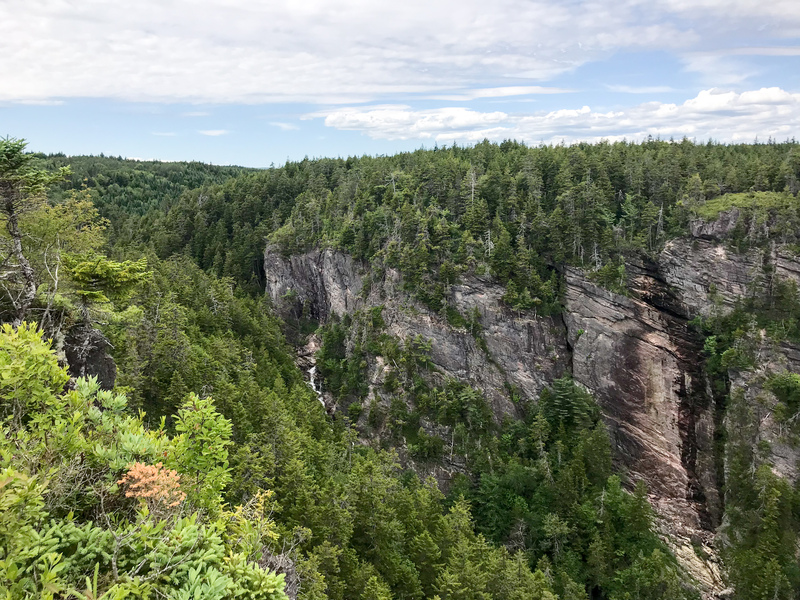 Now try to imagine the look on our faces when we finally made it to the end of the hike and were greeted by a fenced in area with a big sign reading: “Future site of Walton Glen Gorge Falls Observation Deck”! With a little creating tip-towing and peering over the fence we caught a glimpse of the gorge, and were able to stick our phones through the fence slats to get a photo, but the falls were mostly obscured from our location. Hopefully we’ll return in a few years and can get a better look! 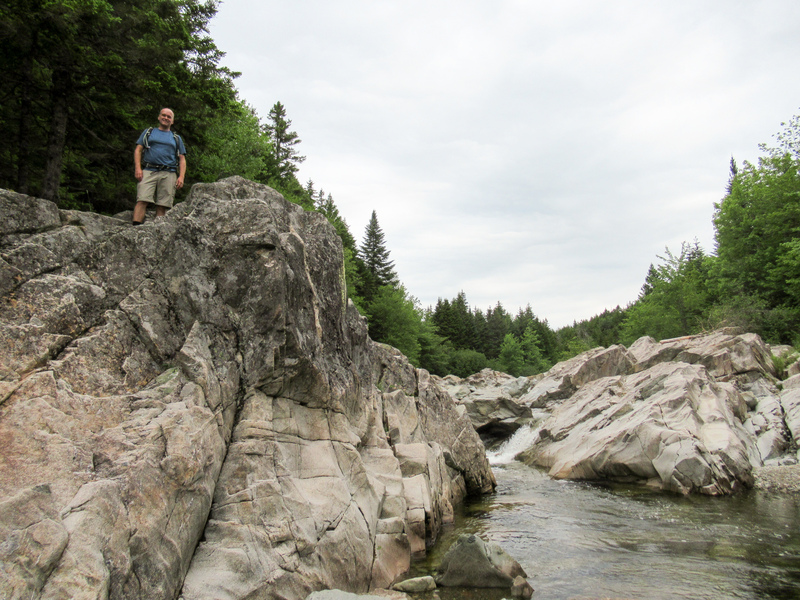 Next up was a trip to Fundy National Park to do some real hiking. The drive from Sussex was an easy 30 minutes to the park entrance, then another 15 minutes to our trailhead. The entrance booth was unmanned when we arrived a little after 9am so we pulled into the visitor center to pay the park entry fee and get advice on the trail. 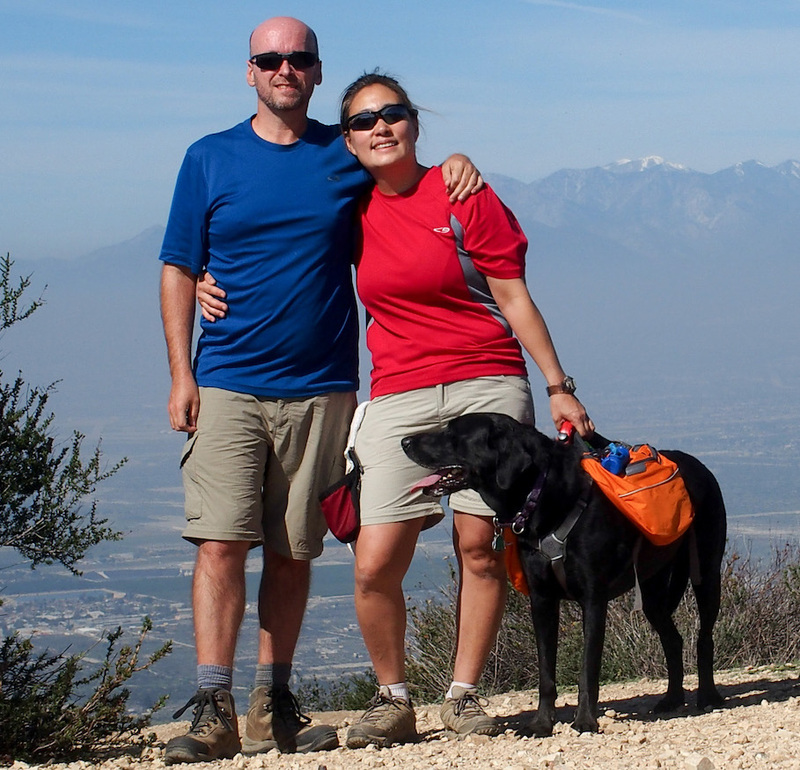 Our goal was to combine two different hikes into one longer loop. 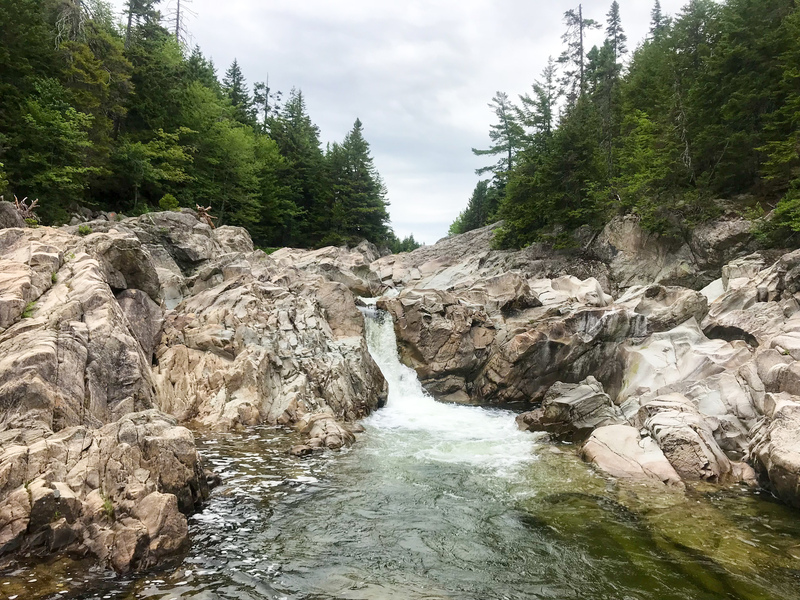 The Laverty Falls trail (3 miles out-and-back) and Moosehorn trail (6 mile out-and-back) both start at the same parking area, and both end at Laverty Falls, just following different routes to get there. 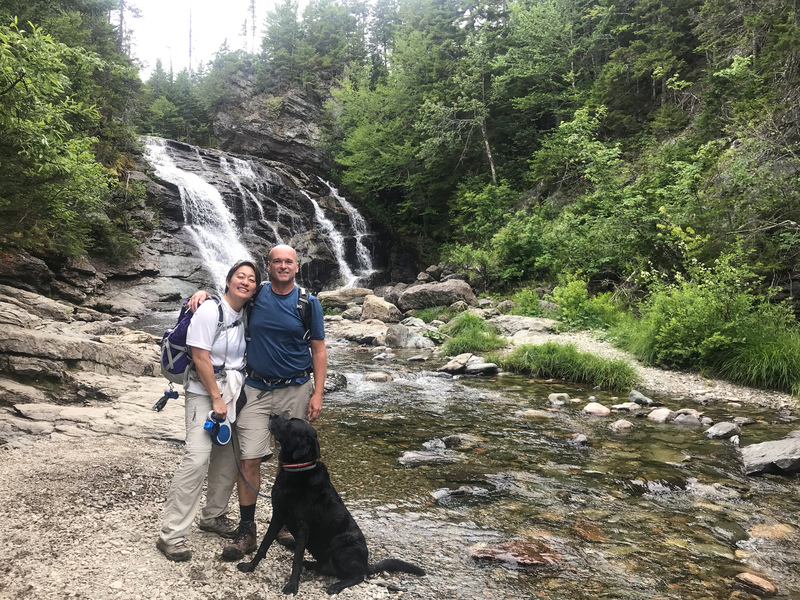 We decided (after reading advice online) to hike the Moosehorn trail to the falls, then take the Laverty trail back to the parking area, for a total of 4.5 miles. 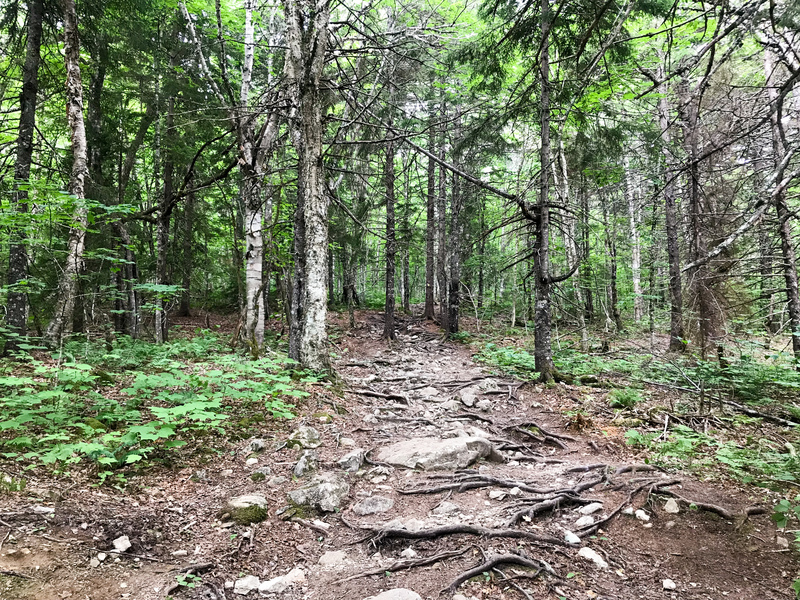 The first half of the Moosehorn Trail (three photos above) was a steep downhill trek through a pretty forest, eventually turning into switchbacks as we descended toward Broad River. Opie was excited when passed our first of several waterfalls, so he could go cool off (somewhat awkwardly) in the small pools under the falls. 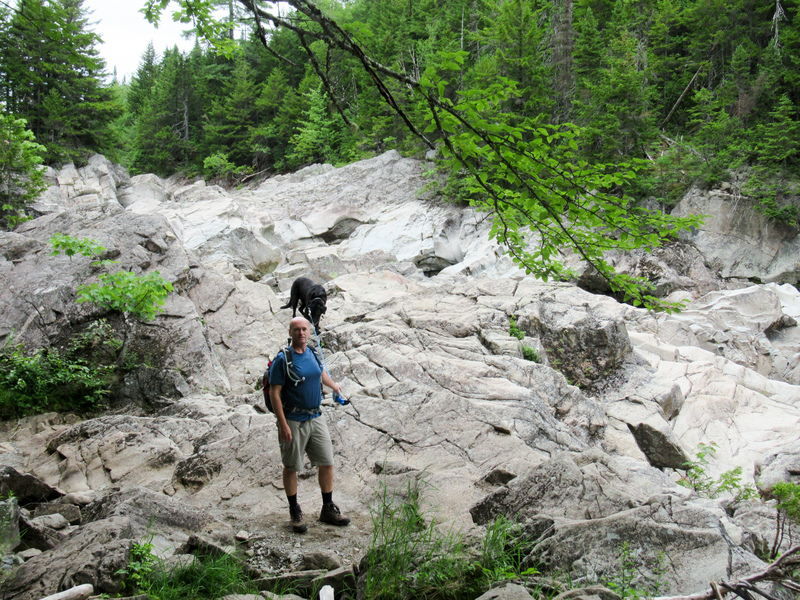 Eventually we made it to the river and started the second half of the trail, which follows the river upstream to Laverty Falls. We love trails that follow rivers! 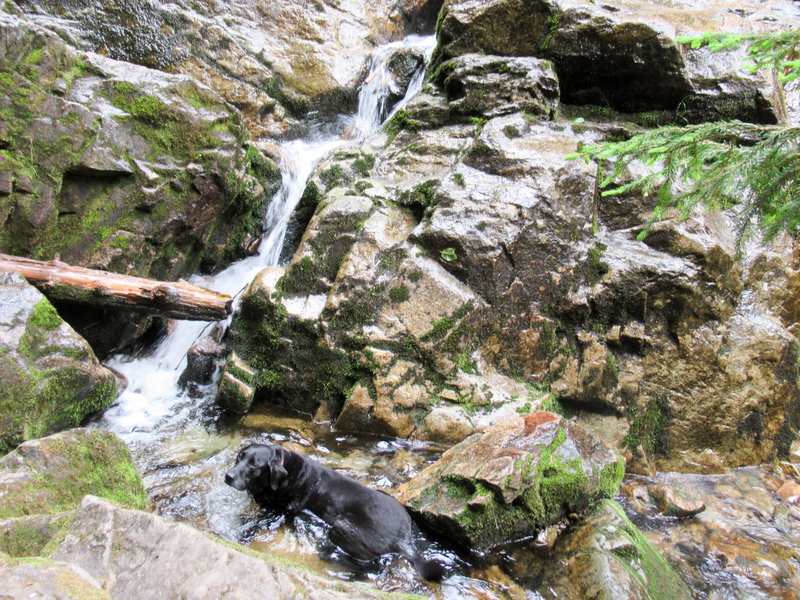 Of course half of that is because Opie is so happy to be wet all the time, but the waterfalls, rocks, scenery, and sounds of rushing water are just wonderful! 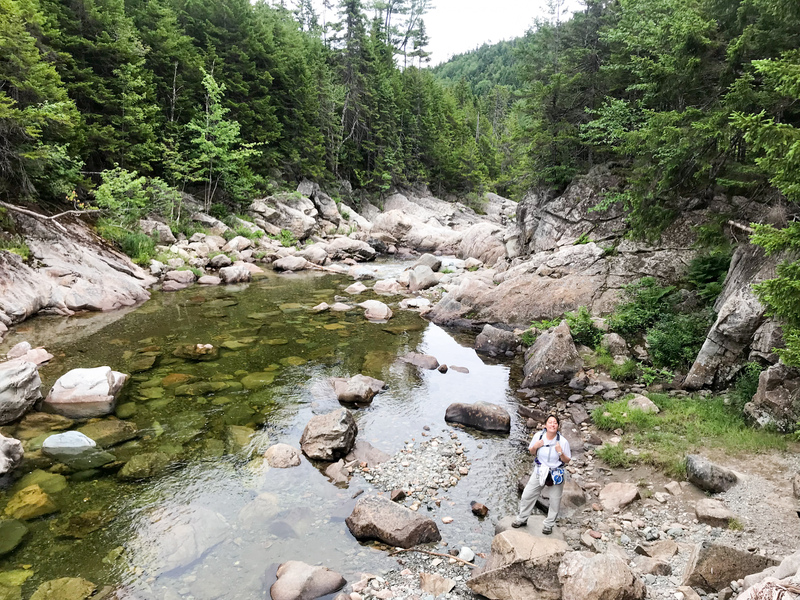 Much like the Fundy Trail, we found the trail to be almost entirely deserted… our kind of hike! It wasn’t until we made it to Laverty Falls that we started running into people. It seems most visitors just take the shorter Laverty Falls trail directly to the falls and then return the same way, since it’s faster and easier. When we returned via that route we passed dozens of people, and found the trail to be fairly uninteresting, just a way to get to the falls. 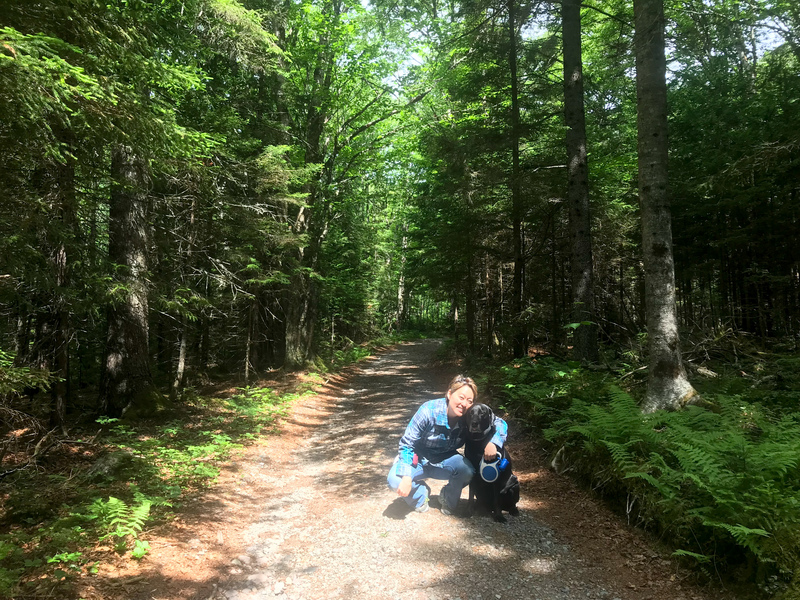 We’re so glad we took the Moosehorn trail! 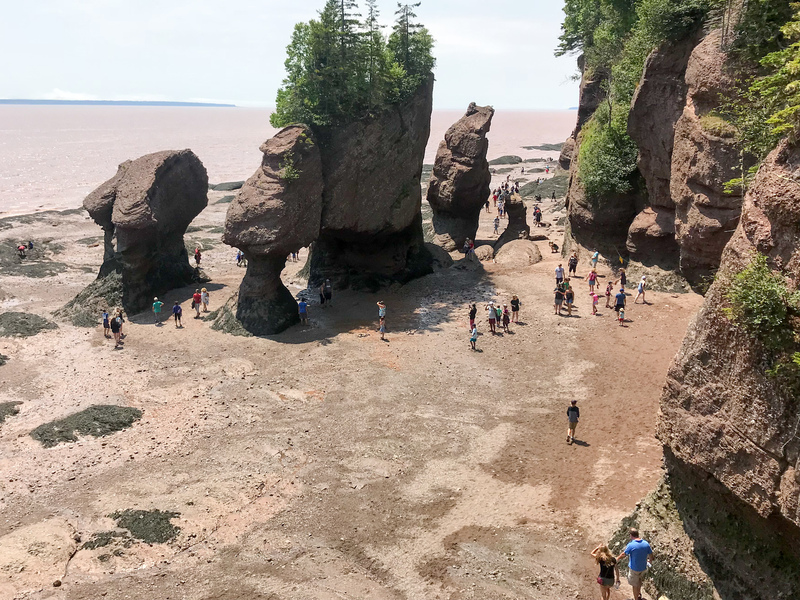 Our final excursion from Sussex was to Hopewell Rocks, which is near the end of the Bay of Fundy and receives some of the highest tides in the bay. The tides have created many interesting rock formations which draw tourists from all over. The tides take around six hours to go from low to high, then another six back to low, for a total of 12 hours for each full cycle. 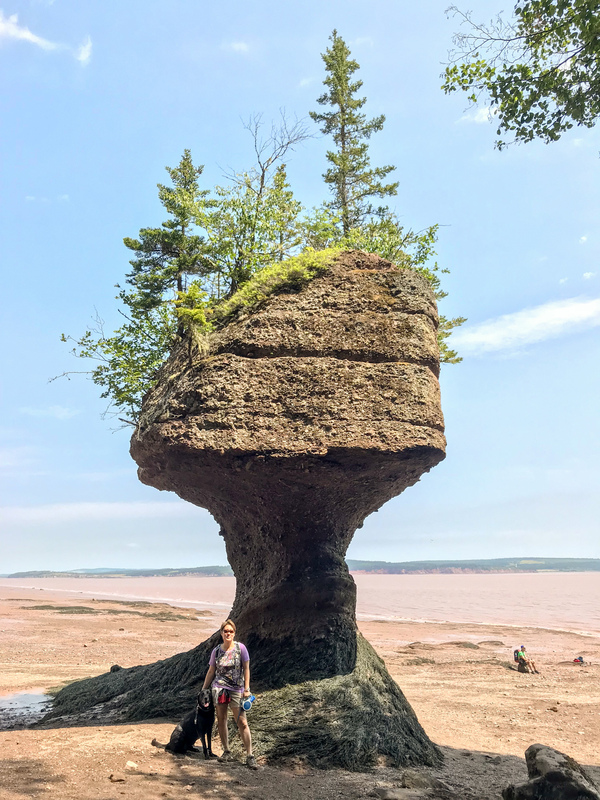 We timed our visit to arrive an hour after low tide so we could still walk the exposed ocean floor and see the full rock formations, but also be able to stick around for a few hours to see how things changed when the tides came back up. 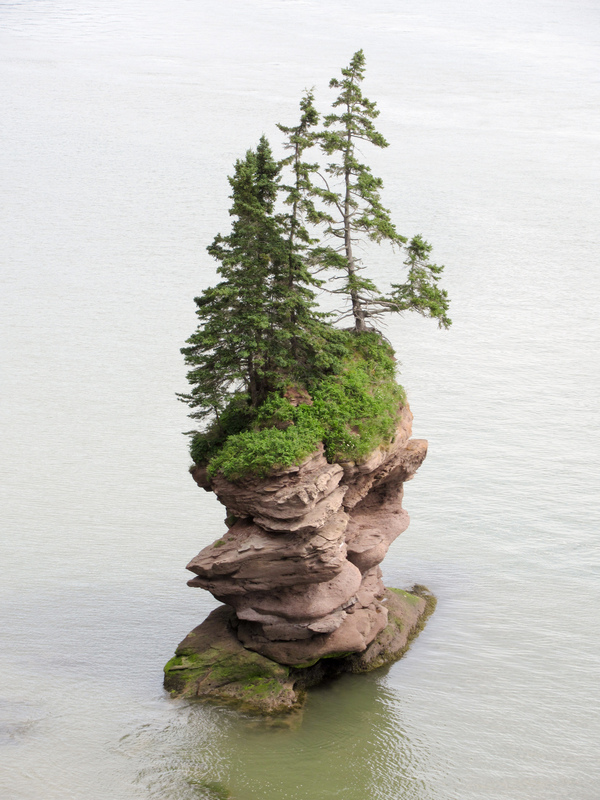 The photo at the top of this page is of the rock formations at Hopewell Rocks. 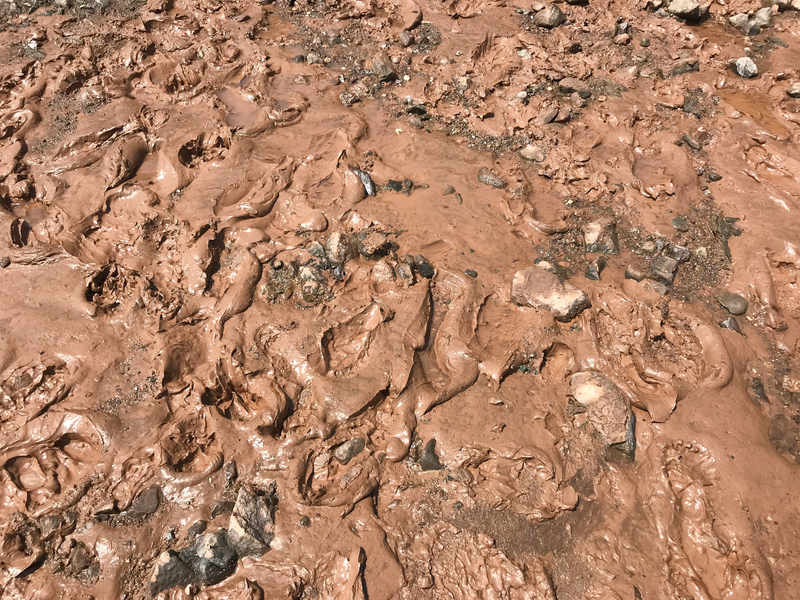 Because the tides are constantly churning up the water and eroding the cliffs, most of the ocean floor/beach is actually a thick, gooey reddish mud. Our sneakers (and Opie’s feet) were pretty gross after walking around, but fortunately there are a couple of shoe-washing stations in the park. If you visit, just be prepared and don’t wear anything too fancy! Overall we were a bit underwhelmed by Hopewell Rocks. There wasn’t a lot to see that we hadn’t already seen elsewhere, and at 90 minutes each way it was quite a drive. 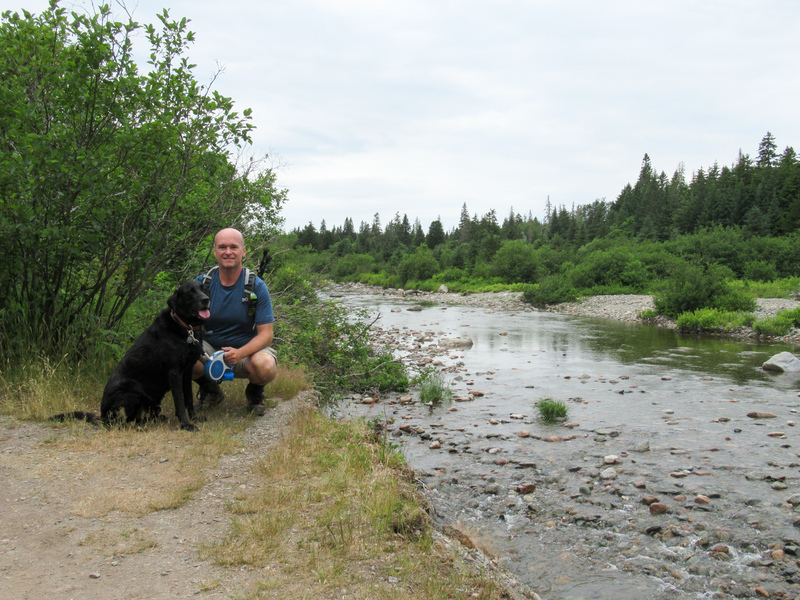 Another contributing factor was that Opie doesn’t really settle down when we go out… he like to be always-in-motion which is why long hikes are so good with him. Hopewell Rocks is a pretty small place and he quickly got bored. This was also the first place in Canada that we ran into actual crowds, probably because of its fame and proximity to the large city of Moncton, so walking him along crowded paths and staircases required our full attention. 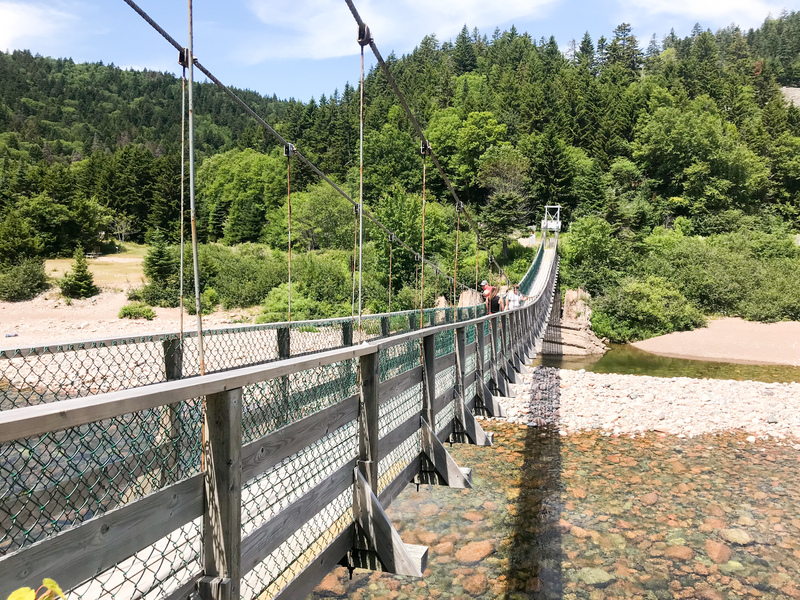 If we’d left Opie at home we probably would have stayed longer, been more relaxed, and enjoyed our visit more, but even so, Fundy National Park and the Fundy Trail Parkway are much more our style and are places we’d love to re-visit in the future! Logo for a new Star Trek reboot? We had to look it up. 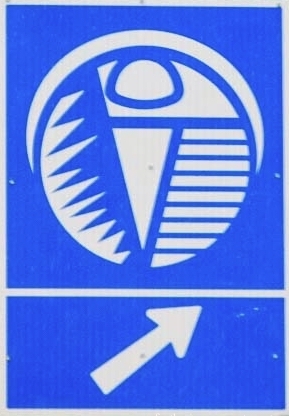 It’s the symbol for the Stonehammer Geopark, because “…the Stonehammer logo recognizes some of the many geological features of the park and the connection between people and geology. The central symbol is the trilobite in honour of one of our best-known fossils”. Yep, that was gonna be my next guess. Wow it all looks so gorgeous,, and hopefully cooler there than in US…love your blogging!! You mentioned they asked you if you had any weapons… did they board the RV? Is it customary they board the RV or is that only when on return from Canada to US? Opie… can we ask, since we will be going as well, what did u have to provide for Opie? Besides Rabies vac… how many other vac or what kind of paperwork did u need to show? Hi Rory. They did not board the RV. I think they only do that if they think you’re lying, or maybe they pick random travelers for more detailed inspection. For Opie we only needed his rabies records. Looks great! 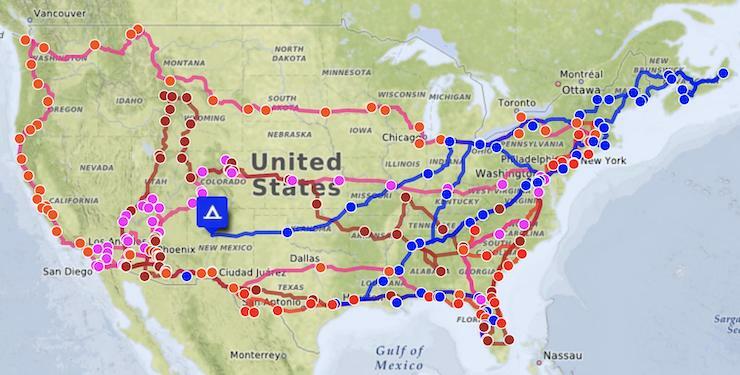 Sounds like the roads aren’t too much different than a lot of the northeast with the exception being most of them are worse in some parts of PA and NY. We were going to go to Canada after Maine but decided not to as we had heard some stories about issues some RVer ‘s had but sounds like you didn’t. Did you have to pay any taxes on things you brought in? We didn’t have any issues. We didn’t buy much in Canada so we had nothing to declare on our return to the U.S. However, U.S. Border Patrol did board us during our return, looked around, and searched our fridge and took some of our vegetables (all new in packaging from Wal-Mart!) saying they are prohibited.